IBC Coatings Technologies manufactures a wide range of standard and custom locator and welding pins. IBC’s locator pins have been tailored for maximum performance using a combination of high strength materials and state-of-the-art surface treatments. IBC’s locator pins are providing industry leading durability and life making them a preferred choice for automotive OEMs and integrators. IBC specializes in providing high quality custom pins with fast turnaround to meet the demands of the automotive industry. Customers using IBC locator pins have reported over 10x life improvement resulting in lower operating cost and reduced downtime. Locator pins are used for precise positioning of components during joining and assembly. The joining can be performed using several techniques including brazing, welding, riveting, gluing, and fastening. As the locator pins repeatedly come into contact with components during the position alignment, they experience considerable wear and impact, hence they should be manufactured with high tolerances from durable materials that can withstand high wear and impact. NAAMS Global Standard Components defines approved components utilized in the design and manufacturing of tooling to produce various sheet metal products, as part of the vehicle body assembly production process. This includes locator pins, for which standards are described in the NAAMS classification. 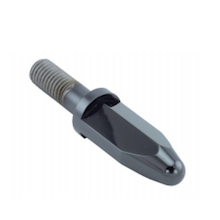 Locator pins used in welding assemblies require additional mechanical and functional properties such as resistance to welding splatter, as well as being electrically insulating. Welding pins are used in Nut welding, specifically as part of the process that is aimed on positioning of the nut. In Projection welding, the weld is localized by means of raised sections or projections, on one or both workpieces to be joined. The projections can also serve as a means of positioning the workpieces. Projection welding is often used to weld studs, nuts, and other screw machine parts to a metal plate. Projection welding equipment is the biggest consumer of welding pins. Additionally, welding pins need to be electrically insulating. A common trend in manufacturing today is that the majority of manufacturers are striving to reduce the weight of their equipment to minimize fuel consumption. This requires new materials that are lighter and stronger, and new processes that can handle these changes. Examples of new materials include high strength steel, aluminum, and titanium alloys; and examples of new processes include hot forming and laser cutting. Traditional locator and welding pins do not provide enough longevity in the new environment and require frequent replacements. IBC Coatings Technologies has applied the principles of material engineering to solve the shortcomings of existing locator and welding pin designs. Starting from the selection of materials – IBC’s pins are manufactured from high strength/high toughness tool steels capable of working at high temperatures. 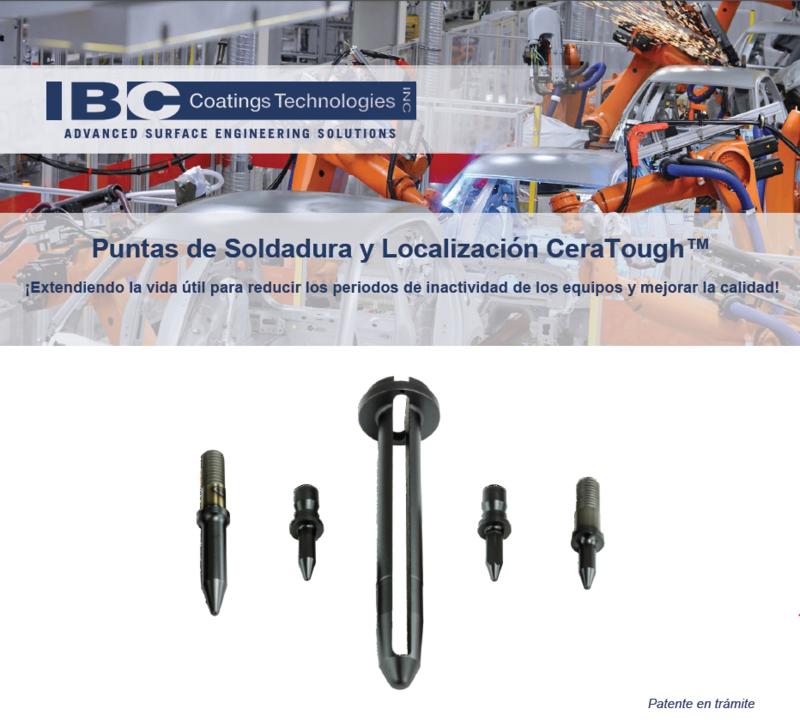 IBC has developed and applied diffusion based coating systems, for both its locator and welding pins, that provide high hardness, low coefficient of friction, electrical insulation, and weld splatter resistance. CeraTough™-D specifically designed for locator and welding pins that require electrical insulation and weld splatter resistance. CeraTough™-D Rainbow for locator pins that do not require electrical insulation and welding splatter resistance. IBC is equipped with the state-of-the-art tribological testing capabilities. This includes on-site equipment such as the latest wear tester (Bruker UMT TriboLab) and profilometer (ContourG-TK 3D). Using this equipment, Wear Testing per ASTM G133 (Linearly Reciprocating Ball-on-Flat), Metallurgical, and 3D Non-Contact Profilometry Analyses were performed to select the best material/coating composition for the locator and welding pins. Wear testing provided coefficient of friction, as well as wear rates of surfaces for both types of IBC pins. Metallurgical surface and cross-sectional analysis provided hardness and elastic modulus for the base materials and coatings, as well as coating thickness. 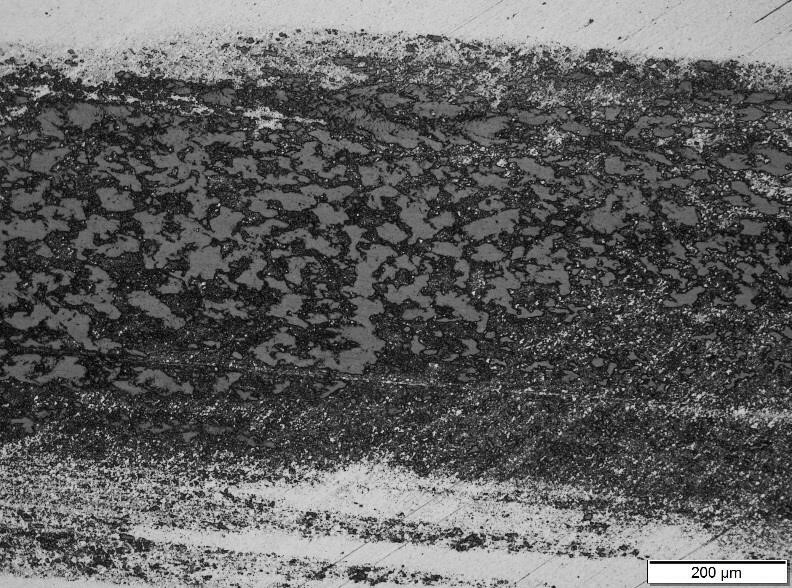 3D Non-Contact Profilometry provided surface roughness and a topographical map of the worn areas that was used to measure wear rate and performance. The tool steels used for CeraTough™ pins include H13 and M2, among others. 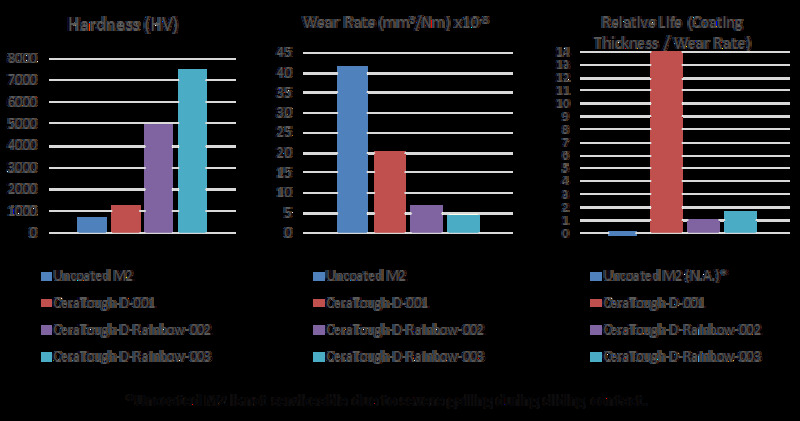 The analysis below shows the comparison of uncoated hardened M2 pin against 52100 steel with CeraTough™-D and CeraTough™-D Rainbow coatings. Figure 1. Wear testing of Hardened M2 pin against 52100 steel. Figure 2. Wear testing of CeraToughTM-D coated M2 pin against 52100 steel. 500x optical image of the wear zone shows no galling. Figure 3. Wear testing of CeraToughTM–D Rainbow coated M2 pin against 52100 steel. 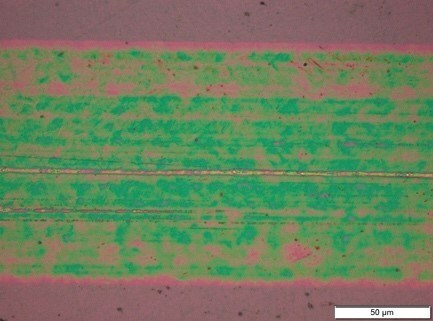 500x optical image of the wear zone shows no galling. In the charts above the subscript 001 through 003 indicates process variants. CeraTough™-D coating is also electrically insulating, which leads to better welds when the locator pins are used in resistance welding assembly operations. Depending on the pin application, the electrical resistance of CeraTough™-D for wet / aqueous immersion applications can be tailored from 0.02 Ω – 195 MΩ (dry electrical resistances are higher), while CeraTough-D™ Rainbow operates best in low to moderate electrical potential environments, or where only intermittent contact is expected (direct grounding not likely) or is otherwise insulated. CeraTough™ coatings have outstanding corrosion resistance characteristics. CeraTough™-D, tested in accordance with ASTM G85 Annex 4 (5% salt spray plus SO2 gas) can withstand up to 400 hours of exposure, or 1000+ hours of ASTM B117. CeraTough™ Locator and welding pins are manufactured per NAAMAS standards, and per individual customer drawings. 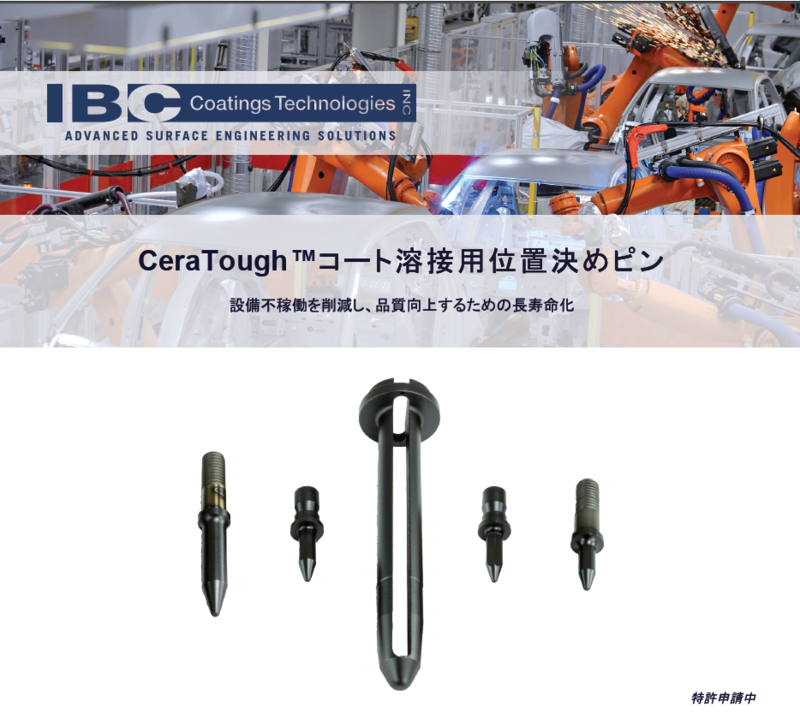 CeraTough™ locating pins are in use across the world by major automobile manufacturers, where they have reliably demonstrated a life improvement of up to 14 times that of the replaced locating and welding pins in extreme applications. 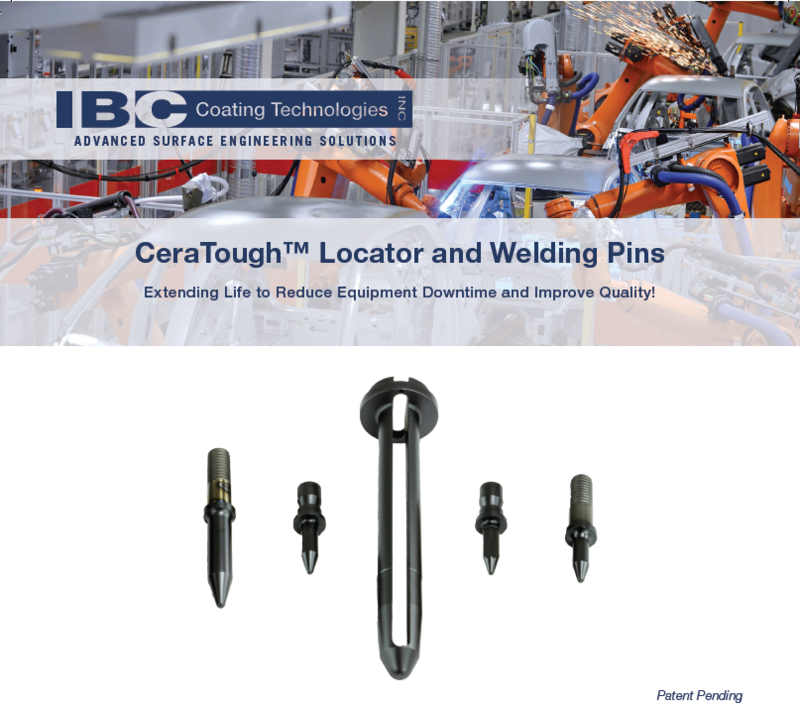 CeraTough™ locating and welding pins’ performance is superior to the best on the market and comparable to ceramic pins but without the inherited brittleness of ceramic.